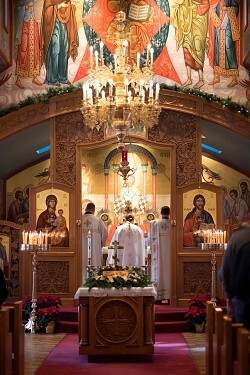 The faithful of Christ the Saviour (www.CTSHBG.org) gathered on Christmas Day to celebrate the Divine Liturgy and partake of God made flesh for our salvation in the Holy Eucharist! Christ is Born! Glorify Him! (Troparion) Thy Nativity, O Christ our God, has shone to the world the Light of wisdom! For by it, those who worshipped the stars, were taught by a Star to adore Thee, the Sun of Righteousness, and to know Thee, the Orient from on High. O Lord, glory to Thee! 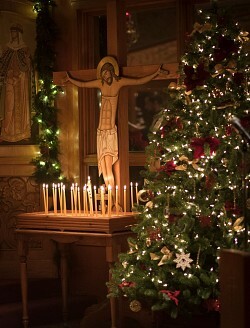 The faithful of Christ the Saviour (www.CTSHBG.org) gathered on Christmas Eve to celebrate the Vigil service to proclaim birth of Jesus Christ - God made flesh for our salvation! Christ is Born! Glorify Him! 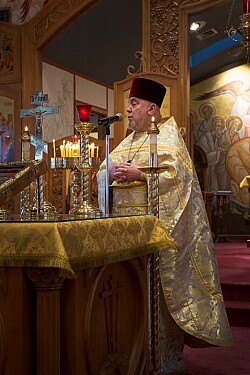 On Sunday, December 16th the community of Christ the Saviour (Harrisburg, PA) welcomed our Diocesan bishop, His Eminence Archbishop Mark for the Divine Liturgy. 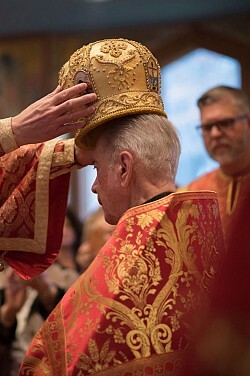 At the Liturgy he bestowed the Mitre (priestly crown) on Fr. 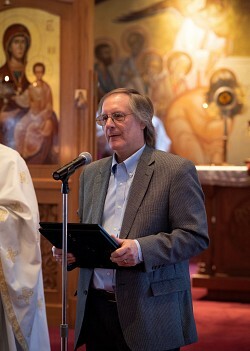 Daniel Resseter in recognition of his long and distinguished service to the Orthodox Church, our parish, and numerous other religious and civic institutions. Axios! He is worthy! May God grant the Mitred Archpriest Daniel, M. Theodora, and their family many blessed years! We also welcomed Fr. 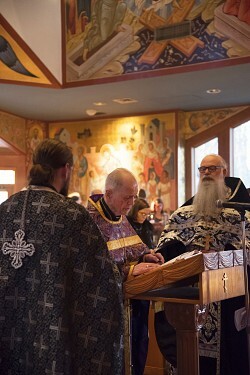 John Parker (Dean of St. Tikhon Seminary); Dn. Moses Locke, M. Christie and their children (our FOCA Adopted Seminary family, also from St. Tikhon's); as well as Mother Christophora (Abbess of Holy Transfiguration Monastery). 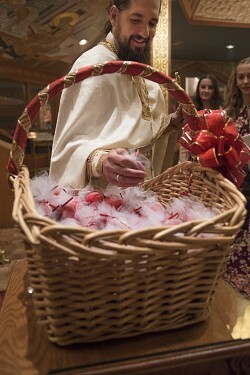 At the conclusion of the Liturgy the parish presented the Locke's with items from their Christmas "wish list" - glory to God! At fellowship the parish presented the Ressetar's with a "get-away" to NYC, and presented M. Theodora with a token of our appreciation for her many years of labor and service in Christ's vineyard - a tiara! 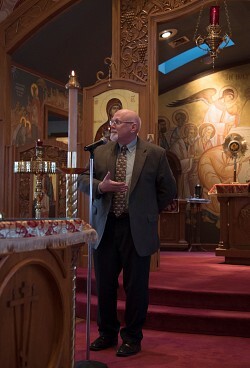 On Sunday, November 18, the community of Christ the Saviour welcomed Dr. Cyril Jenkins from the St. 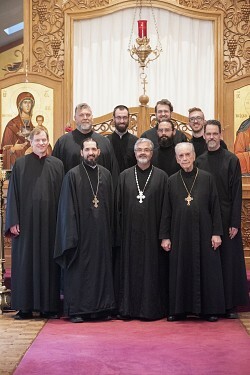 Basil Center for Orthodox Thought and Culture at Eastern University to our parish. To learn more about the St. Basil Center, please visit: www.stbasilcotc.org At fellowship we held our annual Parish Ministry Faire, to encourage active discipleship and engagement in our community. Concurrently, our Sunday School students participated in our monthly "Q&A". Glory to God for all things! On Sunday, November 11th the community at Christ the Saviour celebrated the Baptism of Alexander Lamb, honored our Veterans, recognized ten students who offered their first Confession (and their teachers); then enjoyed our annual Eritrean and Ethiopian Fellowship! 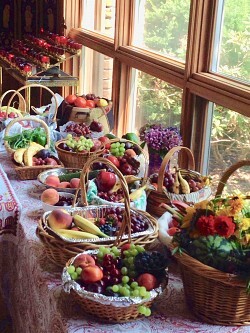 Glory to God for His rich gifts - "Lord, it is good for us to be here"! 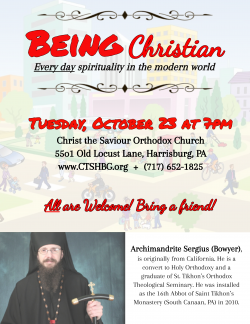 On Tuesday, October 23rd the community of Christ the Saviour welcomed Archimandrite Sergius, Abbot of St. Tikhon Monastery, for a special lecture entitled "Being Christian: Everyday Spirituality in the Modern World". 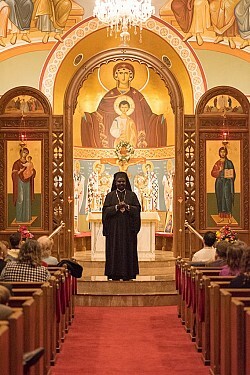 His talk was filled with practical advice, as he made accessible to all, the deep riches of our Orthodox faith and practice. Glory to God for all things! 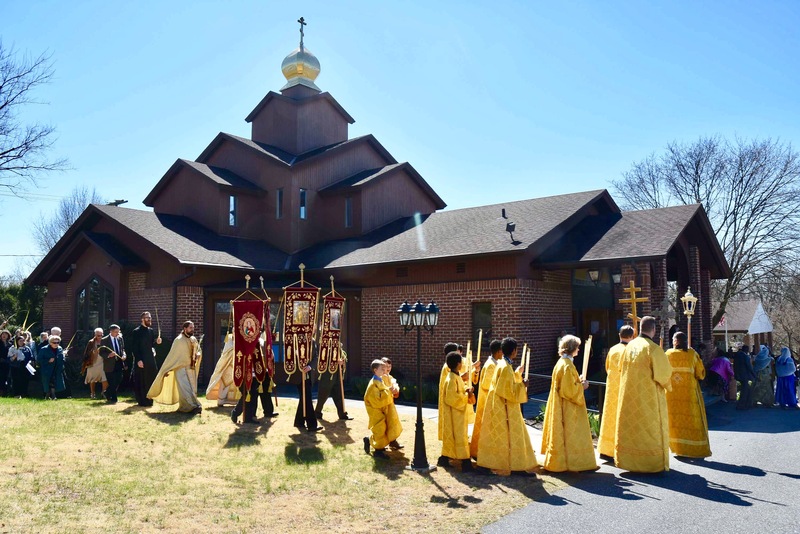 On Sunday, October 14th the community of Christ the Saviour (Harrisburg, PA) hosted the renowned Konevets Quartet from St. Petersburg, Russia. They sang the responses at the Divine Liturgy and gave a short concert of folk music at our parish fellowship hall following. 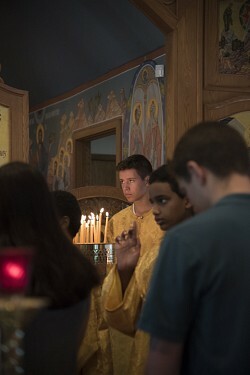 Our faithful and guests were edified by the heavenly Liturgy, and entertained at the concert. Most importantly our souls were opened to the "beautiful" - which is a pathway to experiencing the richness and beauty God! We look forward to welcoming them back again next year! Click HERE for a short highlight video! On Sunday, August 26th our community offered special prayers for our Students and Teachers at beginning of the new academic year. 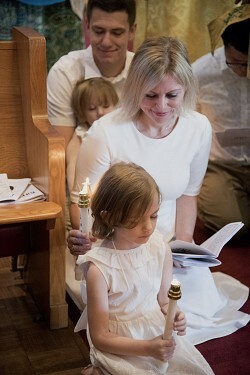 The newly Baptized child of God Marion was "Churched", and received her first Holy Communion, uniting her to our Lord Jesus Christ, and making her a full member of His Body! Following Liturgy our parish Youth Group held a Spaghetti and Meatball Luncheon to help support their programs for the coming year. 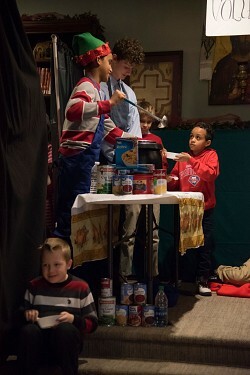 We are so thankful for all of the generosity provided by our beloved parishioners. Glory to God for all things! Blessing of “first fruits” - Thou wast transfigured on the mount. 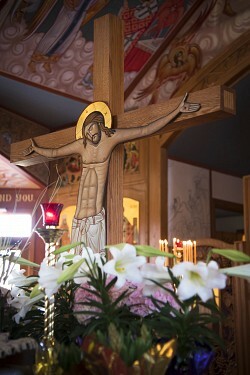 O Christ God, revealing Thy glory to Thy disciples as they could bear it. Let Thine everlasting light shine upon us sinners. 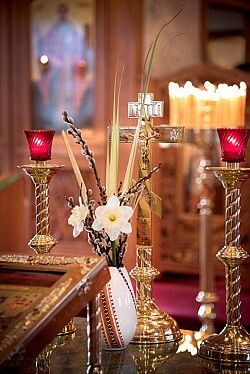 Through the prayers of the Theotokos, O Giver of Light, glory to Thee! On Sunday July 22nd, the community of Christ the Saviour celebrated our annual vehicle blessing in honor of the feast of the great Prophet Elijah (July 20th). On Sunday, June 3rd (All Saints) we welcomed Una McManus into the Orthodox Faith through the Sacrament of Holy Chrismation. 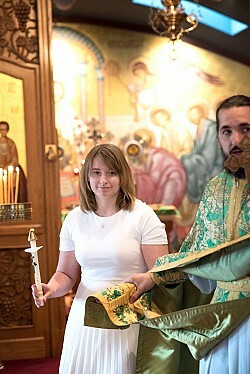 We pray that God would strengthen her, and keep her "as a plant of truth" in the Orthodox Church. 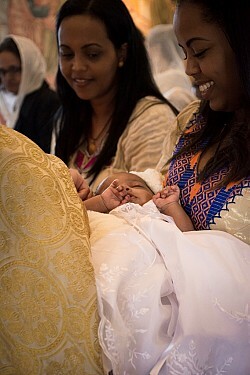 May God grant many years to the newly Illumined handmaiden of God Una and her sponsors, Symeon and Rebecca Jekel. At the conclusion of Divine Liturgy we also recognized our Class of 2018 Graduates. May the Lord continue to guide and bless them, as some continue in their studies, and others begin to apply their education in the workforce! Glory to God for all things! 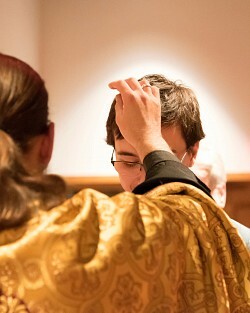 Our community was again blessed to welcome Fr. Theodore and John Jurewicz for several weeks as they completed the Altar and the West walls of our Temple. 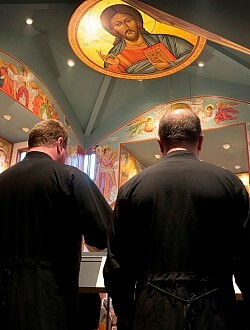 May God continue to strengthen and inspire them in their sacred work. 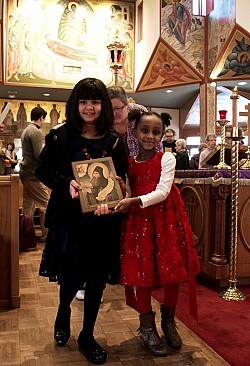 On Saturday, February 17th the community of Christ the Saviour welcomed Mariamne (Winta) Gebre into the Orthodox Christian Church through the Sacraments of Baptism & Chrismation. Congratulations to her parents Yordanos and Selemawi and all who came together to celebrate her participation in Christ's Death and Resurrection! Agia Sophia has donated over $35,000 to local charities in its 6 years of ministry!